Archbishop Philip F. Pocock, D.D. Murray was succeeded as coadjutor by Most Reverend Philip Pocock, D.D., who became the second Archbishop of Winnipeg upon Sinnott's retirement in 1952. Sinnott spent his retirement at Camp Morton where he died at the age of 77 on Easter Sunday in 1954. Pocock was finally successful in retiring St. Mary's debt, and a gala celebration was held to burn the last mortgage on the Cathedral in May 1952. Also during the 1950s, St. Mary's Cemetery had to be restored following the 1950 flood. It was solemnly reconsecrated in September 1960. 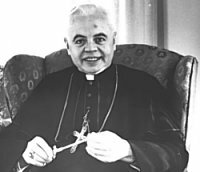 Pocock became Archbishop of Toronto in 1961 and died in 1984. His Eminence George Cardinal Flahiff, C.S.B., D.D. Most Reverend George Flahiff, C.S.B., D.D, succeeded Pocock as archbishop. Born in Paris, Ontario, in 1905, he was ordained as a Basilian Father in 1930, and was named Archbishop of Winnipeg in 1961. He attended all four sessions of the Second Vatican Council and was active in establishing, within the Archdiocese, the changes brought about by Vatican II. He became Western Canada's first cardinal in 1969, thus participating in the conclaves that elected popes John Paul I and John Paul II. In 1962, St. Mary's church-rectory, built in 1873, was demolished. It was replaced by a combined rectory, church office, and parish hall. St. Mary's School was closed in June 1968. It burned down the following year, and the land was sold for construction of a hotel. The 100th anniversary of St. Mary's Cathedral was celebrated with a jubilee Mass in August 1976, followed by a banquet in October. Archbishop Adam Exner, O.M.I., D.D. 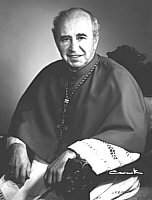 Most Reverend Adam J. Exner, O.M.I., D.D., born at Killaly, Saskatchewan, was archbishop from 1982 until 1991 when he was transferred to Vancouver. He had been ordained in 1957 and became bishop of Kamloops in 1974. Extensive repairs and renovations were made to the cathedral in 1987-88. A combined celebration of its rededication and its centenary (delayed from September 1987) took place in January 1988. 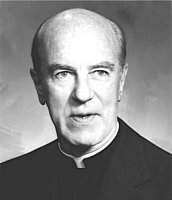 Archbishop Leonard James Wall, S.T.D., D.D. Most Reverend Leonard James Wall, S.T.D., D.D., served as archbishop from 1992 until his retirement in 2000. He was born in 1924 in Windsor, Ontario, and ordained in 1949. He died in 2002. Archbishop James Weisgerber, Ph.L. S.T.L., D.D. Current archbishop is Most Reverend V. James Weisgerber, Ph.L., S.T.L., D.D. He was born at Vibank, Saskatchewan, and ordained a priest in 1963. He was appointed General Secretary of the Canadian Conference of Catholic Bishops in 1990, became Bishop of Saskatoon in 1996, and Archbishop of Winnipeg in 2000. According to the Archdiocese of Winnipeg Directory 2001-2002, there are 170,590 Catholics in the Archdiocese out of a total population of 667,209 people. The Archdiocese contains 52 parishes, 23 missions, and 16 churches with reduced services. It is served by 64 diocesan priests (14 of whom are retired), 28 priests belonging to religious orders, 16 deacons, 3 seminarians, 142 sisters, and 3 brothers. It is divided into five deaneries. They are Dauphin, Brandon, North Winnipeg/Interlake, Central Winnipeg, and South Winnipeg.